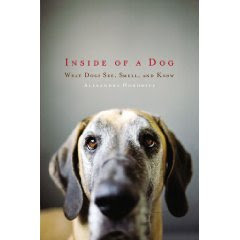 This entry was posted in Inside of a Dog, New book on September 28, 2009 by yourfriends. This entry was posted in Owner resembles pets on September 25, 2009 by yourfriends. 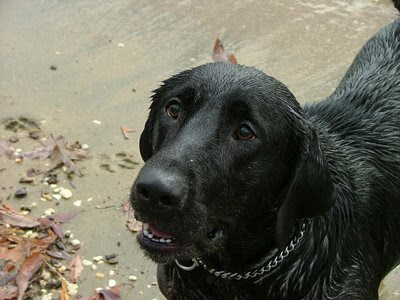 What is Leptospirosis and why should I vaccinate my dog for it? Probably why most clients don’t recognize the name is because when our dogs are puppies, the leptospirosis (lepto for short) vaccine is given in a combo vaccine along with distemper, adenovirus, parainfluenza and parvo. In the veterinary profession we call this combo vaccine simply “distemper”, when in truth they are vaccinated against several diseases. Then, at the dog’s one year physical exam, we say they are due for their distemper and lepto, and you are wondering where this mysterious lepto has come from! To explain, the “distemper” vaccine is still vaccinating your loved one against distemper, adenovirus, and parvo. At Kingsbrook Animal Hopsital we want to assure that we are not overvaccinating pets and for this reason, once dogs reach the one year mark (provided they recieved the correct puppy series while young) the “distemper” vaccine will only be boostered every three years for the rest of their lives. However studies have shown that the lepto portion of the vaccine, previously given in the combo during puppyhood, is not effective for as long and needs to be boostered every year. So starting at one year, they recieve the vaccines seperately and on different schedules. Lepto is considered a core vaccination, yet is not given in all areas or even recommended in all hospitals. Which leads to your next two questions- why is it highly recommended at KAH and what exactly IS IT! Leptospirosis is a type of bacteria highly prevelant in our area that can affect both dogs and humans. The disease caused by this bacteria can quickly infect both the kidneys and the liver. Leptospirosis can be difficult to diagnose because the symptoms that it causes to the liver and kidneys could be caused by many kinds of diseases. There is also the possiblity to get false negative results for specific tests that can be done even in the acute phase of the disease. Lepto can be contracted by direct or indirect contact with the skin or mucous membranes with an infected animal’s urine or by direct organism ingestion. 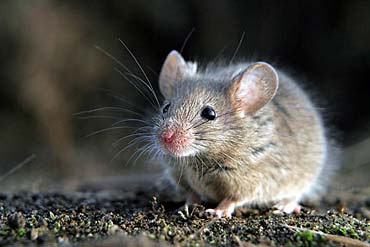 Carriers of lepto include rodents, cattle, swine, racoons, opossums, and several other animal species. Treatment for this disease is supportive care and antibiotics, however it is very expensive and, as mentioned before, difficult to diagnose. Considering this, PREVENTION would be best and inexpensive in light of the difficulties to correctly dianose and treat this disease. Please feel free to ask our staff if you have any questions or concerns about leptospirosis and the vaccine that we administer here at KAH! This entry was posted in Leptospirosis, vaccination on September 22, 2009 by yourfriends. 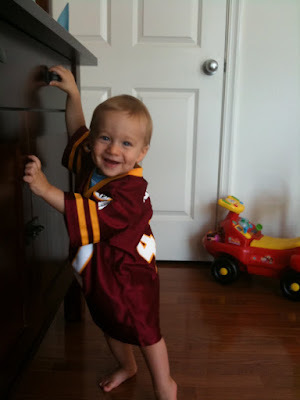 This entry was posted in Jake Davis, Redskins on September 19, 2009 by yourfriends. Recently a group of children from the Church of the Brethern came in for a tour of Kingsbrook Animal Hospital. Dr. Davis gave the children a talk on careers in veterinary medicine and animal health. 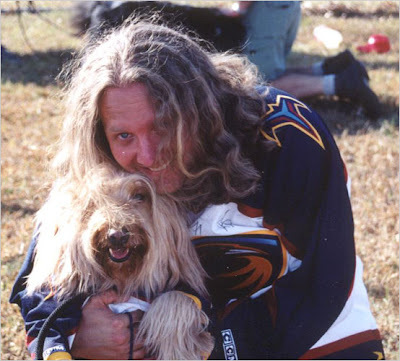 With the help of Bizy, the golden retriever, he also taught the children how to approach animals safely. Technician Sara Moore then gave the children a tour of the treatment area, surgery and radiology. Any schools or civic groups interested in a tour or talk can contact the hospital at 301-631-6900 and speak with our client service specialist, Eileen. This entry was posted in Hospital tour on September 16, 2009 by yourfriends. Our former veterinary assistant, Josh Gourley, who put himself through college by working at our hospital just completed the Appalachian trail. Josh left from Georgia in March and walked over 2,000 (!) miles to Maine by early September. This entry was posted in Appalachian trail, Josh Gourley on September 13, 2009 by yourfriends. Announcing our first Facebook Photo Contest. Follow the instructions and link below to enter your pet’s photo. Pets must be patients of Kingsbrook Animal Hospital to be eligible. Post a picture of your pet. 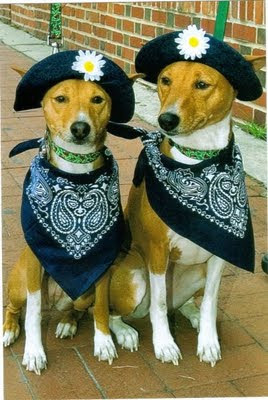 Enter “September Photo Contest” in the decription & don’t foget to put down your pet’s name, too! Tell your friends to vote for your pet! Any Fan of Kingsbrook Animal Hospital can vote. The winner will receive a $50.00 credit for use at Kingsbrook Animal Hospital. We will select the winning picture on September 19th based on how many votes (or “likes”) each photo receives. Only patients of Kingsbrook Animal Hospital are eligible to win. This entry was posted in Facebook contest, photo contest on September 11, 2009 by yourfriends. This entry was posted in ltimore, Top Dogs on September 10, 2009 by yourfriends. Do Animals See In Color? While the question is broad considering the millions of animal species including insects, the general answer is that scientists have reason to believe many if not most animals see in color to some extent. For simplicity, a very general rule is sometimes offered: most diurnal (daytime) animals see in color, while most nocturnal (night) animals don’t — but even here there are exceptions. Animals and insects cover an exhaustive field of biological diversity. The majority of spiders have eight eyes and poor eyesight, while flies have hundreds of tiny lenses and near-360-degree vision. Eagles can spot a mouse from over one mile high (1.6 km), while a sloth has trouble seeing any animal that isn’t moving. Considering this vast diversity, whether or not animals see in color is a question that must be taken species by species. Many nocturnal animals that scientists have studied lack cones, relying instead on greater numbers of rods for extended night vision and keener detection of movement. As an exception to the nocturnal rule, owls do have cones, leading scientists to believe these animals see in color. Most species of primates, birds, cats and dogs also see in color to some degree. Animals like cats and dogs have two sets of cones, making them color-blind to specific colors. They do, however, have many more rods than humans, giving them greater night vision and a keener ability to detect motion. For example, dogs can’t distinguish between green and orange which will both look grayish. Toss a bright orange ball across a green lawn and you’ll find a dog can follow it fine while it’s in motion. Once it comes to rest a distracted dog might lose the ball against the background. Only its shape will cause it to stand out. Feline animals see in color, but they have trouble distinguishing reds; the human counterpart being protanopia. Reds appear as differing shades of gray to a cat. It is believed both dogs and cats see mainly in grays, yellows, and blues. Honeybees and butterflies have three pigment visual receptors with true color vision within their visual spectrum. This spectrum stops short of the infrared but extends into the ultra-violet beyond human vision. Not only can these animals see in color but they can detect a mix of colors as well as pure colors. It is believed coral reef fishes see close to the same rich spectrum of colors that humans see, as evidenced by the many colors present in a coral reef environment. Though not an iron clad assumption, the animal kingdom has evolved bright coloring to both ward off predators and attract mates – an evolutionary feature that would seem to be lost on animals that cannot see color. However, exceptions exist here too and the assumption is somewhat general and speculative. Sea mammals like sea lions, dolphins and whales possess a single type of cone for detecting patterns in light, but not colors. This is known as cone monochromacy and these animals are believed to be totally color-blind. While it might be true that the animals we most closely associate with do not see the same rich spectrum of colors that humans enjoy, it’s probably safe to say that many diurnal animals see in color to some degree. Hence, the next time you find yourself walking down the aisle of your favorite pet store with your cat or dog in mind, you might pass up the red, green and orange to get something in a nice, bright shade of blue or yellow. This entry was posted in pet vision, see in color on September 7, 2009 by yourfriends. The address where your pet was last seen becomes the center point of the neighborhood lost pet alert. Our automated calling system can call thousands of your neighbors within 1 hour, telling them to be on the lookout for your missing pet. Our system is designed to call each number up to four times during our call session in attempt to reach the recipient or their answering service/machine . Also keep in mind that many people have Caller I.D. and may very well call us back based on the number they see and we will be happy to direct them to you! Your lost dog or lost cat message describes your pet in detail, including your contact number, and our website address where the recipient can go to view your lost pet’s picture and information. Ideally if someone has information relating to your missing pet, they will be able to contact you directly. Alternately they may contact FindToto and we will gladly put them in touch with you right away. FindToto brings neighborhoods together to reunite you with your pet. You’d be surprised how well, asking for simple kindness and awareness through our voice message works! It is an immediate, efficient, and proactive service. It’s the quickest way to notify neighbors while you’re making missing pet flyers, driving around and contacting animal shelters. We constantly update our home phone record database to ensure we have the most recent data in your Missing pets area. Previous customers will tell you that they have received a greater response from their neighbors by using FindToto over and above all other lost dog or lost pet services. Proactive: You’re personally notifying your neighbors and not waiting for them to walk by your poster or scan a lost pet database website. You’re reaching out to them for immediate help. Fast: The first hours are so crucial. Our system can call everyone in your neighborhood (while you’re still working on those lost pet posters). Efficient: Have up to 10,000 sets of eyes looking for your missing pet compared to the handful of neighbors who might take a walk that day and actually read your poster. You can actively search for your pet while you are at work. Receive location tips from sightings while driving around looking for your pet. Even if your pet happens to be outside the radius of your lost pet alert calls, word tends to spread pretty quickly and there is a higher chance your missing pet will be found. This entry was posted in FindToto.com on September 4, 2009 by yourfriends.